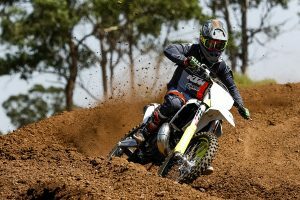 For 2018, Kawasaki has released its flagship KX450F model again featuring a host of impressive features, so how exactly does this bike fair out on track? 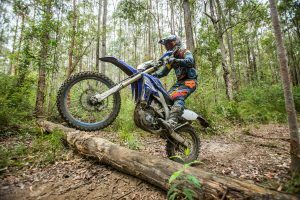 MotoOnline.com.au recently put the bike to the test at Wollongong Motorcycle Club in New South Wales to find out just that. Let’s start with the engine package. Equipped with a four-stroke, single cylinder, DOHC, water-cooled 449cc engine, the 2018 Kawasaki KX450F certainly offers a strong engine package. 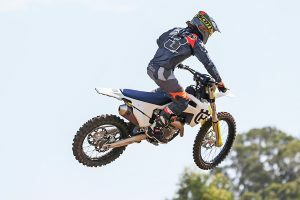 But in saying that, it’s quite a smooth and welcoming engine package, which is something I personally prefer in a 450cc motocross bike. The 2018 Kawasaki KX450F cylinder is off-set 8.5mm forward to reduce the mechanical loss through friction from the piston movement, which allows for more efficient power generation. A special coating has also been used on the intake port cores during the casting process to increase efficiency and performance throughout the rev range. Similar to those found in the Kawasaki Ninja sportbikes, the Kawasaki KX450F features 36mm titanium intake valves that have a slim throat angle and reduced recess to increase high-RPM performance. The intake cam settings maximise low-RPM performance and a lightweight camshaft aids in throttle response and extends over-rev. These features, paired with a bridged-box piston design and a 12:8:1 compression ratio, offer strong performance throughout the rev range and this engine is truly a joy to use. The 2018 Kawasaki KX450F engine rolls on smoothly and continues to pull through to the top. As a result it’s easy to use, yet ready to hit the race track right out of the box. To aid in this ease of use and smooth low-RPM power delivery, a resonator chamber has also been fitted to the exhaust system header. At the same time this also helps to reduce the decibel sound level to meet sound regulations on race day. Intakes and air box shape underneath the also help to ensure clean-consistent air-flow while maximising engine response and reducing intake noise. Happy with the power delivery in standard trim on a mostly slick and hard circuit, we opted to leave the standard four-pin DFI coupler in the bike. 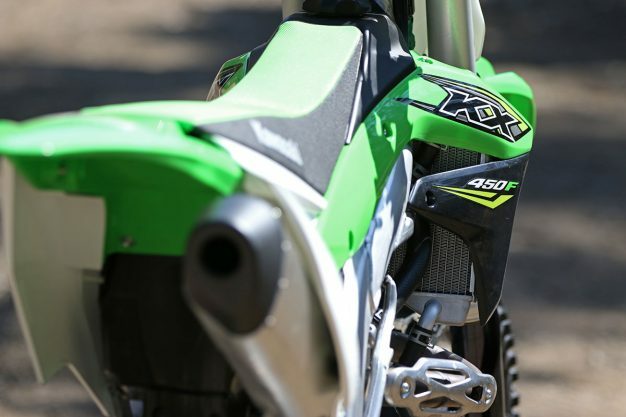 But depending on conditions or your personal preference, the 2018 KX450F maintains the option to change the fuel injection and ignition mapping using the provided couplers. With just the change of a plug you can completely revise the engine characteristics and create a more mellow version or a much more aggressive KX450F. 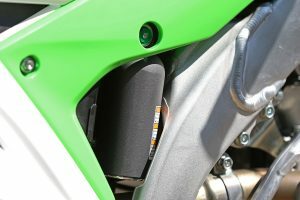 For riders looking to fine tune their ECU, the KX FI Calibration Kit is also offered as part of a selection of Kawasaki Genuine Accessories, which allows access to the fully programmable ECU. 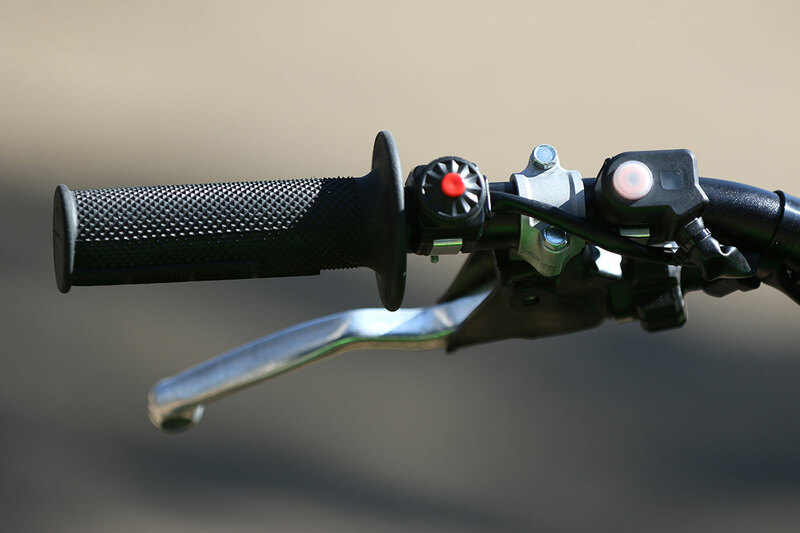 The handheld device eliminates the need for a track-side laptop and gives riders the ability to create custom maps for precise adjustment of fuel and ignition settings. The user-friendly device can store up to seven preset maps and is PC-compatible. To top off the engine and electronics package, the launch control system of the KX450F continues to remain a top feature in 2018. 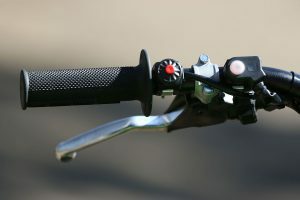 The push-button activation retards ignition timing in first and second gear, helping maximise traction and put the bike’s potent power to the ground. Once the rider shifts into third gear, normal ignition mapping immediately resumes and full power is restored. 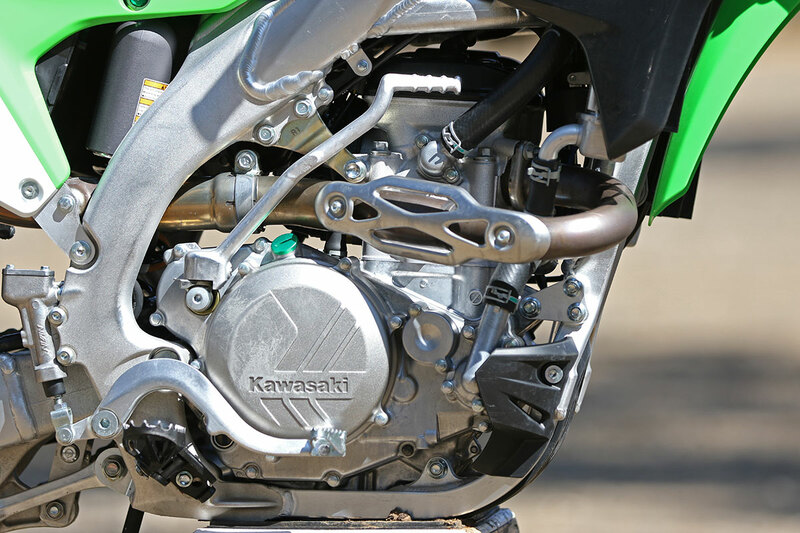 In the chassis department, Kawasaki focused on creating the ultimate aluminum perimeter frame aimed towards providing precise cornering through front-end feel and maximum agility at high speeds. Designed to ultra-thin specifications for a narrow feel, the 2018 Kawasaki KX450F frame feels small and thin between your legs – the bike almost feels like a 250F on-track. It’s remarkable just how small and nimble the Kawasaki KX450F feels and I’m personally a fan of the way this frame has been designed. The overall ergos of the bike could be slightly improved for a rider of my height, but Kawasaki did keep this in mind when they designed the frame. With adjustable foot-pegs that can be lowered by 5mm, this aids in giving a more ‘roomy’ feel to the cockpit. If you’re a slightly shorter rider, you will feel right at home aboard this bike. It still feels comfortable for me, but initially I felt a bit cramped as the seat to foot-peg distance feels slightly shorter than some of the other models on the market today. At the end of the day though, I didn’t notice this anymore and I felt quite comfortable in the seated position. For 2018, the KX450F once again features the Showa SFF-AIR TAC (Separate Function Fork, Triple Air Chamber), which separates the damping and shock absorption duties into the individual fork legs. The left fork contains the damping assembly and the right fork contains the air spring. Instead of the steel coil springs found in conventional forks, the SFF-AIR TAC’s right fork tube has three chambers filled with pressurized air that act as a spring. With the elimination of steel coil springs, friction is reduced, and provides an extremely smooth action throughout the fork’s stroke. This has the added benefit of weight reduction and allows a larger damper piston to be used, further smoothing the action. 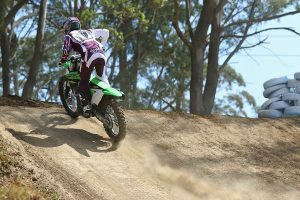 At my level of riding, I was personally a big fan of the front-end on the 2018 Kawasaki KX450F and felt comfortable with the SFF-AIR TAC forks. The front-end of the motorcycle felt very planted at all times and that’s something I always look for in a bike. Yet at speed the bike remained very stable and I never lost trust in the front of the bike, it’s the combination we’re always searching for. 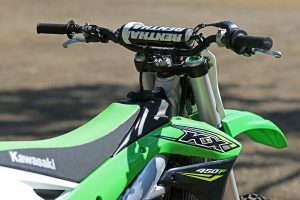 To compliment the Showa SFF-AIR TAC fork up front, the rear of the 2018 Kawasaki KX450F features the Uni-Trak linkage system and a Showa shock. The shock reservoir features internal Kashima coating for improved suspension action and allows for dual compression adjustability and separate high-speed and low-speed damping rates. The overall suspension package did what it should and never really threw out any surprises and that’s really what I’m looking for in a bike. The 2018 Kawasaki KX450F feels predictable at all times and stays planted to the ground due to the Showa package offered on the front and rear. In the chassis and suspension department there’s definitely a lot of good things to say here, while keeping in mind that the track wasn’t overly rough. 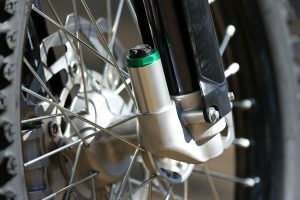 Kawasaki also offers an optional rear suspension linkage tie rod for riders who are seeking an edge over their competition. 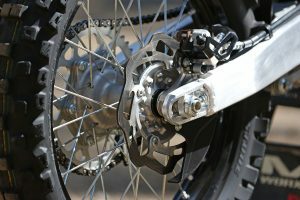 It is 1mm longer than stock and can be used to reduce seat height by 4mm to give the rider adjustment options. Although this option isn’t absolutely necessary, if you feel it could enhance the bike’s performance, it’s nice to know that you can go in that direction too. Obviously with the engine package being super strong and the chassis allowing you to lift the speeds to a higher level, we need to bring this bike to a stop! 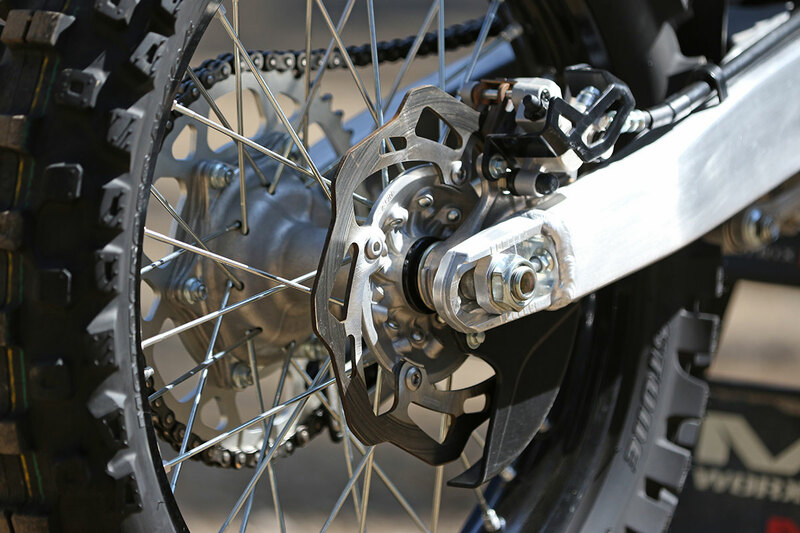 Featuring a Braking 270mm front brake rotor, the 2018 Kawasaki KX450F comes to a stop quite easily. 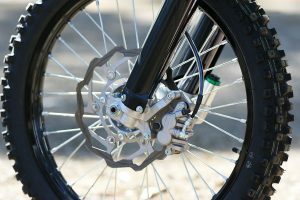 Paired with a 240mm rotor at the rear, the overall braking performance is strong and we had no complaints there. As I mentioned earlier, the ability to adjust the cockpit to suit your needs is great and it doesn’t stop at the foot-pegs. You can also use the four-way adjustable handlebar mounts to fine-tune to comfort level of the 2018 KX450F. I personally found comfort in the standard setting, although I would probably go to a slightly lower bend of bar to suit my style. The sweep of the bar is great, but a slightly lower rise would personally be ideal for me. To go along with its performance, the 2018 KX450F motorcycle features aggressive styling along with in-mold graphics on the radiator shrouds that retain the racy look. The bodywork has been sculpted to match the narrow chassis design and the fuel tank has been designed to lower the overall center of gravity, increasing maneuverability. With performance in mind, the flat design easily allows for movement when changing riding position, while also allowing you to sit further forward. The way the bodywork has been designed on the 2018 Kawasaki KX450F really stands out to me. Not only does the bike look neat, but it allows you to move around freely on the motorcycle without the risk of getting caught up anywhere. It’s definitely comfortable to move around on this bike with its seamless bodywork and flat seat – Kawasaki definitely nailed it in this aspect. 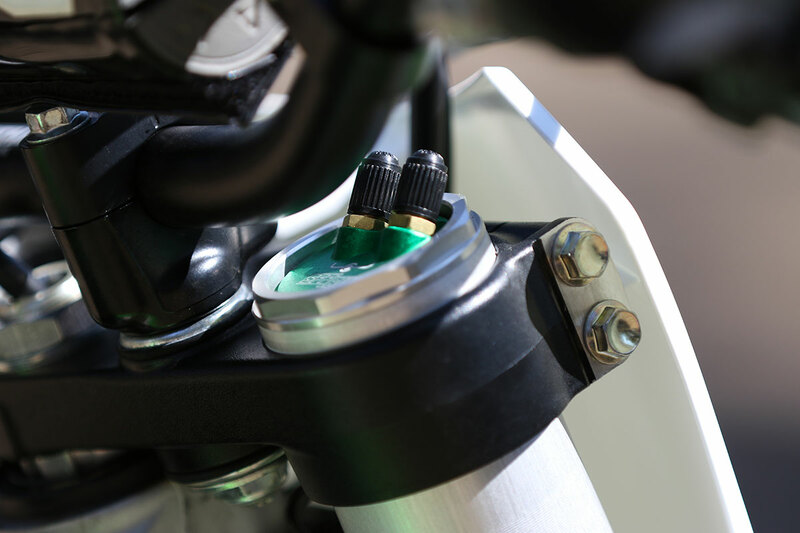 To cap off the look, the 2018 KX450F also features green engine plugs, oil cap and generator cover plugs, as well as green alumite suspension adjusters and black alumite wheels. Just go to your favourite graphics shop, have your numbers printed up and this bike is ready to hit the race track right out of the box. 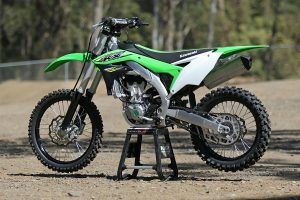 The overall package provided by Kawasaki with their 2018 KX450F is really well-rounded. With a smooth and progressive power delivery, solid chassis and suspension and very well designed bodywork, a lot of boxes have been ticked on this model. It’s a tough market out there in the 450cc category, but Kawasaki definitely do have a strong contender in 2018, there’s no doubt about that. 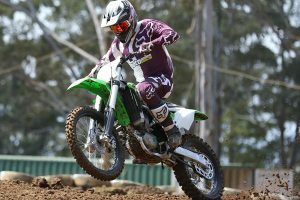 The 2018 Kawasaki KX450F comes in at a recommended retail price of $11,599 and is now available nationwide at your local Kawasaki dealer, head to www.kawasaki.com.au for more information.